NEWS18 INDIA believes in Putting Journalism First. NEWS18 INDIA is also the worlds window into India. The news channel is backed by a team of renowned journalists, supported by cutting edge broadcast technology.  NEWS18 INDIA is an engine of news journalism that treats news as sacred and gives its viewers a voice. The channel through its distinctive philosophy of 9is of journalism ensures that the content is Insightful, Investigative, Informed, Independent, Impactful, Interactive, Inclusive, Immediate and Innovative.